This Final Touch Washroom Cleaner from the Evans brand is a bacterial cleaner that is safe to use on a wide range of hard surfaces. It has a neutral pH making it suitable for use on stainless steel, porcelain, chrome, paintwork, vitreous enamel and ceramic. It is a strong cleaner that can kill a range of bacteria which makes it ideal for use in commercial properties, businesses and homes. This product will be dispatched on NEXT DAY delivery if ordered before 1:30pm Monday - Thursday. The Green Sack GR0007 Extra Medium Duty Black Bag 18x29x38 inches. 100% recycled Polythene. Holds 10kg. This Clean Fast Washroom Cleaner from the Evans brand provides a fast and effective clean on a range of bathroom surfaces. It is an anti bacterial cleaner that can remove limescale, body fat and heavy soiling. It is safe to use on porcelain, chrome, stainless steel, ceramic and quarry tiles surfaces. It is ideal for use in commercial, business and domestic properties. A new and improved formulation of this popular range of hand soaps. Available in a range of refreshing fragrances. Maxima antibacterial moisturising handwash is an un-perfumed anti-bact soap ideal for all washroom areas. 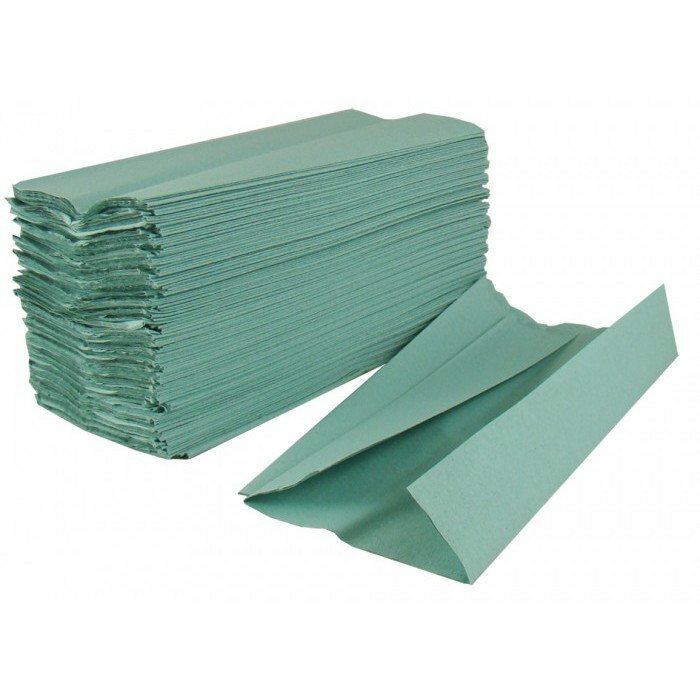 Interfold Hand Towels 1Ply Green x 4000. These cost effective large hand towels fully unfold ready for use. Each individual paper towel unfolds automatically ready for the next user saving time and being more cost effective. A very economical hand towel. Ideal for use in schools, colleges, shopping centres and nurseries. Size per hand towel 247 x 210 mm. 20 packs of 180 sleeves. Cost effective due to fold and size. We at Janitorial Direct are a CHSA Accredited Distributor and this is a CHSA Accredited Product. The CHSA is an organisation dedicated to maintaining high standards and quality of products sold in the cleaning industry. We, as an Accredited Member, have to adhere to a strict code of practice and manufacturing standards, set out and agreed by the CHSA and its members. This means that when you buy a CHSA Accredited product from us, what’s on the box, is in the box. We are audited by the CHSA to ensure that we are adhering to these standards. When you buy CHSA Accredited Soft Tissue products, Plastic Refuse Sacks and Industrial Cotton Mops, you are getting exactly what you pay for. If you have any further questions about this, please feel free to get in touch. Q. How many towels are there in a pack costing £22.71 and are discounts available for buying in bulk? A. There are 4000 single towels to a case, discount is available for bulk purchases- please call us on 01562 512870 for a quote. Q. Are these towels biodegradable? A. These towels are not biodegradable, however biodegradability is always as it seems, some products which are biodegradable can take tens or even hundreds of years to do so.